The Civil Aviation Authority of Singapore (CAAS) plans to develop a system to monitor unmanned aircraft systems. An examiner’s bag containing 32 O-level additional mathematics scripts from Singapore was taken by mistake by a train passenger in Britain in November last year. The leader of Singapore’s only opposition party with members in parliament said there is a real risk it could lose all its seats as the city-state prepares for an election in coming years. The Ministry of Health (MOH) will be able to remotely monitor people who may have infectious diseases, with the passing of the Infectious Diseases (Amendment) Bill yesterday. A bird got a free ride on a Singapore Arilines flight from Singapore to London, and only got caught when the plane was two hours away from landing. Trek 2000 International is acquiring a 7.5% stake in energy solutions company Terrenus Energy for US$3 million ($4.06 million). A record-breaking 84.8 per cent of students scored at least five passes at the GCE O-Level examinations last year, according to results released by the Ministry of Education (MOE) and Singapore Examinations and Assessment Board (SEAB) on Monday (Jan 14). Sapphire Corporation, the infrastructure design and construction group in China, announced that the group’s 97.6% owned subsidiary, Ranken Railway Construction Group Co, has secured a Engineering, Procurement and Construction (EPC) contract of RMB 832 million ($166.5 million) related to its PPP project in Chengdu. Tensions between Singapore and Malaysia over territorial claims have worsened as the neighbors postponed a Monday meeting to discuss the development of border areas. Singapore’s CapitaLand (CATL.SI) is forking out S$6 billion ($4.4 billion) to scoop up logistics and industrial assets from state investor Temasek, in a deal the developer said would create Asia’s largest real estate investment manager. A third employee didn’t seem able to recognise what a ‘security incident’ was, and persistently failed to report them. Singapore retained its position as the world’s leading bunkering port last year while also increasing the number of containers that passed through the docks. Singapore’s diplomatic rift with Malaysia over airspace and maritime boundaries is unlikely to go away soon, the Lion City’s Foreign Minister Vivian Balakrishnan said on Monday, as he blamed the island state’s larger neighbour for a “downward spiral” in ties. DBS/POSB customers keen to get their hands on new and good-as-new notes for the upcoming Chinese New Year will be able to do so from today at any of 42 temporary ATMs installed across the island. THE Monetary Authority of Singapore (MAS) on Monday unveiled a S$75 million initiative to help boost equities research and enhance Singapore’s status as a hub for equity listings. The planned Rapid Transit System (RTS) Link between Johor Baru and Singapore is behind schedule and not progressing well, Transport Minister Khaw Boon Wan said yesterday. The National Environment Agency (NEA) conducted more than 2,400 checks on food caterers last year, Senior Minister of State for the Environment and Water Resources Amy Khor said in Parliament on Monday (Jan 14). The Monetary Authority of Singapore (MAS) will launch a new S$75 million grant to help enterprises seeking to raise capital through Singapore’s equity market. The Ministry of Health (MOH) instructed all public and private healthcare institutions to conduct immediate safety reviews after it discovered that some dental equipment which had not been sterilised fully was used at Tan Tock Seng Hospital (TTSH). Creative Technology said yesterday that it is ready to work with original equipment manufacturers (OEMs) to incorporate its Super X-Fi headphone technology into their products after getting a good response from some large players at last week’s CES tech trade show. Questioning Malaysia’s sincerity in resolving the bilateral disputes, several Members of Parliament (MPs) on Monday (Jan 14) wanted to know how much Singapore is willing to tolerate, in the face of continued provocation by its neighbour despite repeated warnings from the Republic. CapitaLand Ltd. said it would buy another real-estate company from Singapore state investment firm Temasek Holdings Pte. for more than US$4 billion dollars. CITIC Envirotech (CEL) has secured three projects in China worth a total of RMB 1.46 billion ($292.3 million). The first is a RMB 506 million public-private-partnership (PPP) project in Dongyuan County, Guangdong Province. Construction demand is expected to remain strong this year due to sustained public sector contracts, as the industry continues to recover from a challenging three-year spell. The deal may ease concerns on debt payment risks with its $450m retail bonds maturing in November 2019. Under the masterplan, public transport is seen as a transport mix termed Walk-Cycle-Ride and would include rail, buses, private hire cars as well as active mobility devices like e-scooters and bicycles. Several other IHiS employees were commended for handling the incident beyond their job scope and responsibilities. Singapore is looking to tighten its adoption laws after a gay man won an appeal to legally adopt his biological son in a landmark court ruling last year, its Social Affairs Minister said. The number of coins that a buyer can use in a single transaction will be streamlined and standardised to 20 coins per denomination after Parliament passed the Currency (Amendment) Bill on Monday (Jan 14). WITH the 2019 Singapore Budget around the corner, the government faces complex and interconnected choices on how best to deploy fiscal tools to encourage job and wealth creation to enhance its economic competitiveness, while ensuring sufficient tax revenues to fund public spending. Policymakers are pressed to better fund healthcare and education, provide support for young parents, invest in infrastructure and keep the country secure. SINGAPORE is home to the highest percentage of online businesses selling globally, according to a report published by technology firm Stripe that surveyed companies across 15 markets. The National Environment Agency (NEA) is looking at ways to alert people more quickly about food operators who have had their licences suspended. 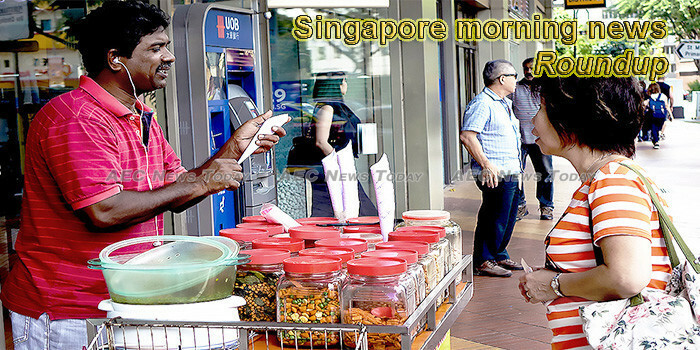 Parliament passed a law yesterday that puts more payment services, such as digital payment tokens and merchant acquisition, under the ambit of the Monetary Authority of Singapore (MAS). At the age of four, when most of his peers were learning to read and write, Ryan Lu was learning to read lips. An Indonesian businessman with interests in the hotel industry and real estate claimed two police officers from Bali tried to take him back to the island while he was recovering in a Singapore hospital. Two senior managers at the Integrated Health Information Systems (IHiS) have been sacked for being “negligent” and “in non-compliance of orders” during the 2018 SingHealth cyberattack, which contributed to the unprecedented scale of the incident. Consumers who deposit money into their mobile wallets with larger payment-service providers can be assured that their money will be safe, even if the companies go belly up. Singapore needs to clarify details of how HDB owners can retain the value of their properties under a proposed government scheme. If not, general elections, which has been rumoured to be called this year, has “no way” of happening. Singapore is looking to strengthen its adoption laws after a gay man won an appeal to legally adopt his biological son in a landmark court ruling last year, its social affairs minister said on Monday. Users’ GrabReward points can be converted into STAR$ and exchanged for CapitaVouchers. Roughly 700,000 of data centre space is expected to have been completed in 2018 with the stock set to more than double by 2022. An islandwide Quick Response (QR) code system to ensure that shared bicycles are parked within designated areas kicked in on Monday (Jan 14), catching some riders unawares. The control of infectious diseases within Singapore will be given a shot in the arm through amendments made to the Infectious Diseases Act. Singaporeans account for half of the faculty at the six local universities, with the number remaining stable over the last 10 years, said Education Minister Ong Ye Kung. ST Engineering says that its marine arm has secured $560 million worth of new contracts in 4Q18. The Monetary Authority of Singapore (MAS) is set to launch a new $75m grant for Equity Market Singapore (GEMS) on 14 February in its efforts to enhance Singapore’s role as Asia’s centre for capital raising and enterprise financing, an announcement by minister for finance and MAS board member Heng Swee Keat at the UBS Wealth Insights conference revealed. Is Genting Singapore A Bargain Now? What do Genting Singapore’s metrics tell us about the company? Two years after they found a way to turn coffee waste into biodegradable plastic, scientists from Nanyang Polytechnic have discovered how to convert used coffee powder into a material with fire-retardant qualities.